I'm guilty of this kind of namby-pamby thinking myself, but a new year has brought Gandhi-like clarity to my thoughts about the Browns' situation under center. McCoy's got cajones of tempered steel, that is certain. Beyond that toughness, I see an undersized, skittish kid lacking the arm strength to consistently make the throws the tops guys make all the time. Perhaps more alarmingly, the accuracy that was supposed to be McCoy's strength has dissipated along with his pocket presence. McCoy's problems this year are somewhat related to his receivers and injuries on the line, as well as learning a new system in a foreshortened training camp. Doling out such excuses doesn't help the Browns, though. Top QBs overcome a roster's shortcomings and make plays. Colt has only made a handful this year. The Browns not seeming to know what they have in McCoy necessitates risk. 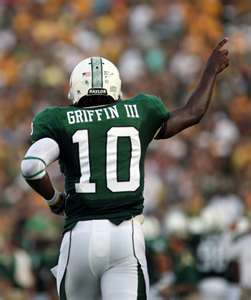 If a Robert Griffin III is there with the fourth overall pick in the draft, then the front office has to nab him. The Heisman-winner has been tabbed as a raw prospect whose ability to throw down the field while in the pocket has improved this year. However, like many young fellers of a similar skill set, he has the tendency to bail on plays, tucking and running instead of keeping his eyes on receivers. It's a high ceiling that the Browns need to be gunning for. As of Sunday's game against Pittsburgh, the Browns had the 29th ranked offense and averaged just 13.9 points per game, which is 30th in the league overall. Those problems may flow from a coach making bad calls, but that has little to do with a QB who again and again is unable to hit his wideouts in stride. Ignoring the quarterback position and drafting a Blackmon or Richardson would certainly help McCoy. But as starved as we are for a winner, we shouldn't be looking for a franchise that may top out as a wild card playoff candidate if everything else falls into place besides the most important position on the field. This regime cannot afford to wait for McCoy to develop if there's a better option available. The argument that the Browns will inevitably "ruin" Griffin or another potentially talented quarterback as they did Tim Couch and now McCoy does not wash, either. First, drafting a signal-caller early does not preclude the front office from collecting surrounding talent through either free agency or the remainder of the draft, which for the Browns includes an additional first-round pick. What's more, the offensive line that helped concuss McCoy this year is not going to be the same exact unit next season, you nutbags. Think, man, think! Perhaps Couch, and now most likely McCoy, were ousted because they were not very good. McCoy may have developed as far as he's going to, and I've seen little that proves he's much more than an average quarterback and future backup. The Browns need a true leader under center- a colonel, a kaiser, a czar! A lean, mean live wire of a player whose arm strength and accuracy are not constantly a question mark- someone for whom the intangible "it" is evident from his first year at an offense's helm. Otherwise, for the Browns and their fans, waiting will continue to be the hardest part.